The stadium is named after Nemesio Camacho, former manager of the then-existing streetcar system of Bogotá and also the father of Luis Camacho Matiz, the person who offered the land where the stadium would be constructed. The name Campín comes from a modification of the word "camping" because the area where the stadium currently stands was formerly a camping zone. It entered service as a football stadium around 1946, just in time to host the first national club tournament. It was used as the final venue for 2001 Copa América, where the Colombian team were crowned champions of the American continent defeating Mexico 1-0. This stadium was one of the eight stadiums of the 2011 FIFA U-20 World Cup held by Colombia and hosted its closing ceremony. In 1934, Jorge Eliécer Gaitán, then-mayor of Bogotá, had the idea to build a stadium for the pleasure of the citizens of Bogotá, taking advantage of the occasion provided by Bogotá's 400th anniversary, and also to host the 1938 Bolivarian Games. Until the opening of Estadio El Campín, the only major football ground in the city was the relatively small La Merced ground. Shortly after, then-councilman Luis Camacho offered a land to the city of Bogotá where the new stadium could be constructed. At the time of the first Colombian Professional Football championship (1948 Campeonato Profesional), the stadium's capacity was of 23,500 seated persons. The stadium has been remodelled many times, and although the stadium's maximum capacity reached a maximum of 62,500 at 1968, capacity has since been decreased over time through various renovations. The first game hosted at El Campín was a soccer match between Ecuador and Colombia, on August 10, 1938; Colombia lost 2–1. Millonarios has called El Campín their home ground since 1938, Santa Fe has played there since 1951. El Campín has been used several times to host matches of the Colombian national football team, most notably the Copa América 2001 final against Mexico. El Campín was one of the many football grounds that could have been affected by FIFA's decision to forbid playing international football in places located above 2500 meters above sea level, but FIFA has since allowed international FIFA games in this stadium. Until the field was renovated in 2005, many musical concerts were held in the stadium. Concerts and other cultural events were soon banned to protect the grass on the field. Concerts were then held at the Simón Bolívar Park, Palacio de los Deportes Arena, Movistar Arena, Plaza de Toros de Santamaria, Jaime Duque Park and Corferias. 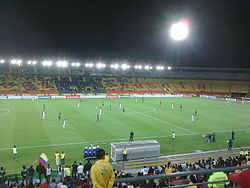 December 15, 2011 the Congress approved a law that requires mayors to provide the use of stadiums in all Colombian cities at least once a month. Days later president Juan Manuel Santos approved the law. In consequence, since 2012 the stadium can be used again as venue for cultural events and it opens the possibility for great international singers to perform in Bogotá in 2012. The Ministry of Culture, Recreation and Sport and the Institute for Recreation and Sport (IDRD), utilized various techniques to determine the impact of large events on the grass of the sports arena. Tests simulated the effects of a large crowd on the field. "The first stage of the test consisted of pruning, surveying, geotechnical engineering and agronomy of 100 square meters of turf," said District. Also installed were protective devices that distributed weight and allowed photosynthesis to occur. Next a stage was installed and 400 graduates of the police auxiliary took the field, under which were placed the various turf protection elements, until a density of four persons per square meter was achieved, which is the density typical of large events. The staff entered at 4:00 pm and stayed until 10:00 pm. March 8, 2012 the Ministry of Culture, Recreation and Sport confirmed that the stadium would again, after a 4 year pause, host concerts and cultural events. On March 15, 2012 concert producer Fernan Martinez and Bogotá Mayor (Gustavo Petro) confirmed that Paul McCartney would perform during his On the Run Tour on April 19, 2012 at the stadium. On March 27 at 4:00 p.m. tickets for the concert became available in TuBoleta and at 5:30 p.m. 75% of the tickets were already sold. It is expected for the show to sold all the tickets in less than 24 hours. In March 27 tickets started to be sold at 4:00 p.m. and one hour and a half later 75% of the tickets were already sold. 24 hours after 90% of the tickets were already sold. Lady Gaga performed as part of her The Born This Way Ball on November 6, 2012 at the stadium in front of 30,546 people. British boyband One Direction performed at the stadium for the very first time in Colombia on April 25, 2014 during their Where We Are Stadium Tour 2014. Tickets for the show sold out in a record time, prompting concert producers to add an extra 6,000 tickets which also sold out the first day they became available for a total of 36,386 tickets sold by December 21, 2013. Shakira holds the artist record for most events held at the stadium, having performed 5 shows since her first tour. The Foo Fighters performed for the first time in Colombia at the stadium on January 31, 2015. The Rolling Stones performed for the first time in Colombia during their Olé Tour on March 10, 2016 at the stadium in front of an estimated 45,000 people. U2 performed for the first time in Colombia as part of their "The Joshua Tree 30th anniversary Tour" on October 7, 2017, also to an estimated audience of 45,000 people. ^ "Estadio Nemesio Camacho 'El Campín': 71 años de triunfos y glorias" (in Spanish). Retrieved 2011-02-01. ^ "Ministerio de Cultura de Colombia". www.mincultura.gov.co (in Spanish). Retrieved 2017-03-18. ^ "404". www.rcnradio.com. Archived from the original on 2012-03-18. Retrieved 2017-03-18. ^ "Fernán Martínez, el empresario que traería al músico Paul McCartney, habla de la posibilidad de usar el estadio de la capital. El comentarista deportivo Iván Mejía se opone". Retrieved 2017-03-18. ^ "Habrá conciertos en estadios - vive.in". Retrieved 2017-03-18. ^ Radio, Caracol (2012-02-10). "Distrito abre el debate para decidir el préstamo de El Campín para conciertos". Caracol Radio. Retrieved 2017-03-18. ^ "Inicio - Fantastica". www.fantastica.com.co (in Spanish). Archived from the original on 2014-05-02. Retrieved 2017-03-18. ^ "404". www.rcnradio.com. Retrieved 2017-03-18. ^ "McCartney, fenómeno en ventas en Bogotá - vive.in". Retrieved 2017-03-18. ^ "One Direction | On The Road Again Tour 2015 | ON SALE NOW!". One Direction. Retrieved 2017-03-18. ^ "Boletería para Foo Fighters en Bogotá, desde $82 mil | ELESPECTADOR.COM". ELESPECTADOR.COM (in Spanish). 2014-10-02. Retrieved 2017-03-18. ^ Tiempo, Casa Editorial El. "La noche en que 45.000 personas sacaron la lengua con Rolling Stones". El Tiempo (in Spanish). Retrieved 2017-03-18. Wikimedia Commons has media related to Estadio Nemesio Camacho El Campín.